Lindell Lee Houston (January 11, 1921 – September 9, 1995) was an American football guard who played eight seasons in the All-America Football Conference (AAFC) and in the National Football League (NFL) with the Cleveland Browns. He was the older brother of Jim Houston. Houston played with the Browns from their inception in 1946 through the 1953 season. Cleveland reached the league championship game in each of Houston eight seasons with the club, winning four times between 1946 and 1949 in the AAFC and once in the NFL in 1950. Houston played for coach Paul Brown during every phase of his football career: at Massillon (Ohio) High School, Ohio State and the Browns. He retired from football after the 1953 season and worked as an executive in the steel industry. He died in 1995. Houston was born in Illinois, but his family moved to Ohio after a relative got a job at a steel mill in Massillon and convinced his father to move there. Houston had been a standout basketball player in Illinois, but Paul Brown, the head football coach at Massillon Washington High School, thought his combination of quickness and size would make him a good football player. He started as a middle guard on defense but was soon switched to an offensive guard, where he excelled. The Associated Press named him a first-team All-Ohio guard in 1938. After graduating from high school, Houston attended Ohio State University. He played as a guard on the school's varsity football team starting as a sophomore in 1941 under Paul Brown, who had by then been hired as the school's head football coach. Houston sat out for two weeks with a knee injury but returned to finish the season, and in 1942 became a regular starter at right guard. Collier's named him an All-American that season, when the Ohio State Buckeyes football team won the school's first national championship. Houston joined the U.S. Army in 1943. He stayed at Ohio State but was not allowed by the Army to play on the football team. In 1944, he played in the College All-Star Game against the Chicago Bears. Houston signed in 1946 with the Cleveland Browns, a professional team under formation in the new All-America Football Conference and coached by Paul Brown. Houston became a starter when Bill Willis was ill in 1946. The Browns won the AAFC championship that year. In later seasons, Houston rotated with Bob Gaudio as part of a system where Brown used guard substitutions to relay plays to his quarterback. The Browns won three more AAFC championships in 1947, 1948 and 1949 before the league dissolved and the Browns were absorbed by the more established National Football League. The Browns won the NFL championship in 1950, their first season in the league. Houston's job was to protect quarterback Otto Graham and open up running room for fullback Marion Motley. He was known for his toughness and durability. 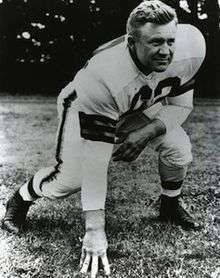 In a 1950 game against the Washington Redskins in which the Browns were ahead 24 points, he rushed through five Redskins players to make a tackle on a kickoff, risking injury. He played through a bad cold and injuries to his shoulder and face. Brown used him as a model to demonstrate blocking technique in training camp. The Browns reached the championship game in 1951 and 1952 but lost both times. Despite his reputation for durability, Houston suffered from numerous injuries during his career and announced he would retire after the 1952 season. He changed his mind, however, and returned in 1953, when the Browns again reached the championship game but lost to the Detroit Lions. He retired for good in 1954, after 12 years playing for Paul Brown's teams. He left the game to concentrate on his job at the Sharon Steel Products Company. Houston spent much of his life after football as a steel executive. He died of cancer in 1995 and was inducted into the Stark County High School Football Hall of Fame in 2008. 1 2 3 4 5 Harpster, David (July 9, 2008). "Move to Massillon paid off nicely for Houston". The Independent. Retrieved August 25, 2012. 1 2 Dietrich, John (October 26, 1941). "Northwestern Conquers Ohio, 14-7". Cleveland Plain Dealer. p. 1. They regained the ball when Lin Houston, sophomore guard from Massillon, crashed through and snared Graham on the 4. ↑ "Sweeney Hurt In Ohio State Drill". Cleveland Plain Dealer. Associated Press. November 13, 1941. p. 21. Lin Houston, first string right guard, already had been counted out this week because of a knee injury suffered in the Pittsburgh battle two weeks ago. ↑ Dietrich, John (August 31, 1943). "Ohio State's First Football Turnout Reveals 90 Per Cent 17-Year-Olds". Cleveland Plain Dealer. p. 14. Watching from the sidelines in the stadium today were ... Lin Houston, All-American guard, who has been located here by the army, who also has to sit it out. ↑ "Rams' Coach Watches Chicago Game Tonight". Cleveland Plain Dealer. August 30, 1944. p. 14. ↑ "Brown Explains All 'Secrets' Of His T Formation". Cleveland Plain Dealer. May 4, 1946. p. 16. ↑ Sauerbrei, Harold (November 3, 1946). "Willis Forced To Bench By Illness". Cleveland Plain Dealer. p. 3C. Lin Houston, another former Ohio State guard, will take Willis' place on the right side of the line. 1 2 3 4 Sauerbrei, Harold (December 14, 1950). "Browns May Be 24 Points Ahead, but Lin Houston Never Eases Up". Cleveland Plain Dealer. p. 28. ↑ Piascik 2007, pp. 82, 120–121, 146, 151. ↑ Piascik 2007, pp. 233, 253. ↑ Doyle, James E. (August 7, 1953). "The Sport Trail". Cleveland Plain Dealer. p. 21. Lin Houston, who called it a football career a fortnight ago, has rejoined the Cleveland Browns. ↑ Piascik 2007, p. 281. 1 2 "Houston Retires as Pro Gridder". Cleveland Plain Dealer. February 12, 1954. p. 28. Lin Houston made it official yesterday, the Cleveland Browns' guard announcing that he is retiring from professional football, to devote full time to his job as a representative of the Sharon Steel Products Co. Lin, who played 12 years for Paul Brown – with Massillon, Ohio State and the Browns – had decided to give up football a year ago, but changed his mind.